I'm often asked to name one simple action step that people can take to improve their health. My answer is usually this: Eat more green vegetables. I'm not taking about adding a few florets of broccoli to your dinner. For measurable improvement in your health, I suggest eating at least the equivalent of about 5 big handfuls of dark greens every day. If you start doing this on a daily basis, you can confidently expect to feel stronger and healthier in the days ahead. The micronutrients in dark green vegetables are essential to building and maintaining healthy skin, hair, and nails. Dark greens are loaded with minerals that you need to build and maintain strong and healthy bones and teeth. Through my experiences, I've come to believe that no other food group is more effective at remedying sensitive teeth and gums. Per calorie consumed, dark greens provide more nutrient-density than just about any other food group that we know of - this means that you experience maximum nourishment and cleansing per mouthful, with virtually no chance of gaining unhealthy weight from regular green food consumption. Dark greens are rich in fiber, which you need to keep your colon clean and healthy, and lower your risk of developing colo-rectal cancer. Dark greens are rich in carotenoids and other phytonutrients that can significantly reduce your risk of developing all types of chronic disease. The phytonutrients in dark greens are especially effective at promoting optimal eye health. I used to believe that eating only fresh varieties of dark greens was the best approach to nourishing and cleansing my body. But after a few years of doing this and working with a number of clients who also followed a whole food-only approach, I began to suspect that degrading soil quality was leading to nutrient-depleted fresh greens at most grocery stores. That's when I began experimenting with super green food powders, which are made by carefully drying organically grown green vegetables and then micropulverizing them for optimal absorption. Our organic green food blend was born out of those early days of experimenting, and to date, many thousands of people all over the world are benefiting from this nutrient-rich organic green food product. Though I consider our organic green food blend to be one of the best of its kind, I noticed over the years that a small percentage of the population seems to have trouble tolerating one or more of the ingredients. For some people, chlorella appears to be a problem. For others, wildcrafted sea vegetables like dulse and kelp are difficult to tolerate because of taste or iodine content. And for others still, I have come to believe that the comprehensive probiotic formula just isn't optimal for their unique constitutions. But because so many people are benefiting from our original green food formula, I haven't wanted to make significant changes to it to address the rare challenges noted above. The solution that I came up with was to provide a nutrient-dense super green food formula that contains just 5 select, organically grown greens that are extremely well tolerated by the masses. This new product is called 5 Super Greens, and it's just as nutrient-dense as our original formula, but it's free of sea vegetables, chlorella, spirulina, and friendly bacteria. There are actually six separate ingredients, but organically grown barley is in two forms - whole leaf and juice, thus the name of 5 Super Greens. All of the juices are 33:1, which means that 33 pounds of fresh, organically grown vegetables are used to produce each pound of nutrient-dense juice powder. All of our organic juices are carefully dried at low temperatures (below 100 F) to preserve heat-sensitive elements. That's it, that's all that you'll find in 5 Super Greens. No fillers like apple pectin, oat bran, rice bran, soy lecithin, or various grains and seeds - these filler ingredients are healthy on their own, but it just doesn't make any sense to me to include them in an organically grown super green food product. And here's an important point about the ingredients in 5 Super Greens: our nutrient-dense vegetables are grown in mineral-rich organic soil for months, rather than in trays for a few days - these ideal growing conditions maximize the levels of food-based vitamins, minerals, phytonutrients, and chlorophyll in the final product. Suggested Usage: Take one teaspoon per 50 pounds of body weight per day, all at once, or spread out. Mix well with water, fresh juice, or smoothies. Because 5 Super Greens is 100% organically grown food, it is completely non-toxic and can be taken in larger quantities if intense nourishment and cleansing are desired. It's actually quite pleasant, with a slightly malty flavor. I really like this green food powder mixed with water, a smoothie, or a freshly pressed vegetable juice. 5 Super Greens tastes quite different from our original super green food product, mainly because 5 Super Greens doesn't contain any sea vegetables, chlorella, or spirulina. 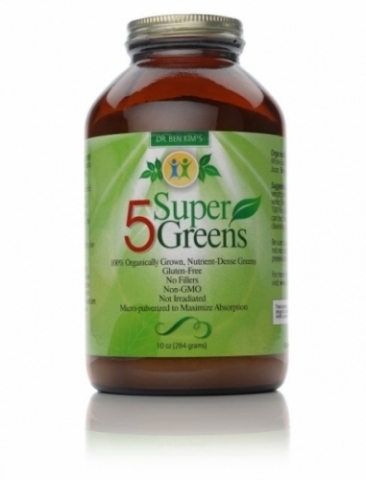 Who is 5 Super Greens intended for? Anyone who wants to ensure optimal intake of organically grown greens. This is not a supplement - it's a nutrient-dense whole food blend that you can be certain is extremely rich in food-based vitamins, minerals, and phytochemicals that you need to experience your best health at any age. If you tried our original organic green food formula and had trouble taking it because of the taste or because of intolerance to one or more ingredients, then 5 Super Greens is likely an excellent alternative for you. How is 5 Super Greens different from the original super green food formula? 5 Super Greens doesn't include sea vegetables, chlorella, spirulina, friendly bacteria, a separate enzyme formula (though it contains naturally occurring enzymes), and a few other land vegetables. The nutrient-dense vegetables in 5 Super Greens provides many of the same nourishing and cleansing benefits that our original formula offers, and the taste is more widely tolerated, especially by children. 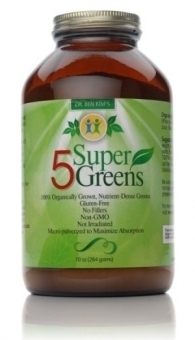 Another difference: Though 5 Super Greens comes in an amber glass bottle with a metal lid and oxygen absorber to maximally protect against nutrient degradation, it comes in a 10 ounce size only (our original super green food product comes in a 16 ounce size only). Due to a difference in density when compared with our original formula, this is the best packaging option available for our clients and readers. Please note: Due to a minor labeling mishap, the label for 5 Super Greens reads 284 grams; please note that this should read 227 grams, which is 8 ounces, or half a pound. Any way one can add more veggies is a bonus. It does have a really green flavour, but those who eat kale and such will not be bothered by it. It's just a very concentrated vegetable flavour, perhaps not one that kids who don't like veggies will love. It is very distinct. My favorite way is to mix a teaspoon into a glass of Mott's Clamato, any of the flavours. I find that palatable. Add a pickled bean and a shot of vodka.and you will have a very green Caesar! (I have not really tried that yet!) But yes, a good way to get more greens into your diet! These are amazing. I tried the regular greens, but the sea veggies didn't agree with me. These are great! Ok, I have used up 6 jars and the difference is amazing. At first I didn't notice anything but then I realized that the changes were subtle. After 6 jars the changes are very easy to spot. I sleep better, feel better, better nails & hair, and normal digestion. I agree with Susan (1st review) that I would like the other stuff in this but I also don't do well on the spirulina and chlorrella THANKS! I have been taking this product for about a month and I see a definite improvement in my fingernails. I'm 64 years old, generally in good health, very active (lots of hiking! ), but felt my diet could use some help. The greens are great. Wish I could take the organic greens but I can't tolerate spiralulina and chlorrella I would love to have all those other ingredients though. Still I'm happy to have this option and I sure seem to be benefitting from it. Thanks, Dr. Kim!